Conflict resolution of some sort or another forms the backbone of most games. In formal game theory of the type originated by von Neumann and Morgenstern it might take the form of a pay off table. In a game like chess the movement abilities of the individual pieces determine how an enemy piece is “captured.” In a game like risk a six sided die and the laws of probability rule the day. The core mechanic that Armageddon Empires is built upon is called a “Challenge” and although luck plays a role, if you set your challenges up correctly you will succeed most of the time. 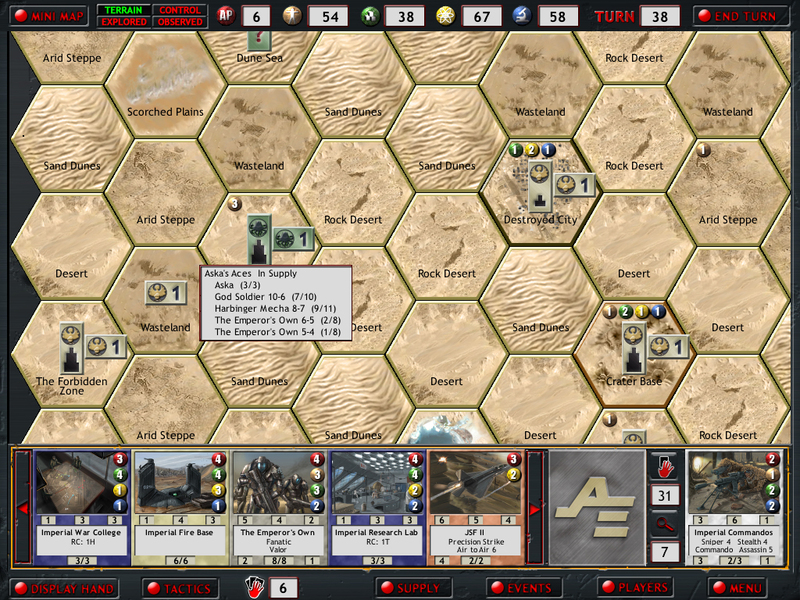 Basically any time a result must be determined in Armageddon Empires two attributes ranging from 1 to 10 in strength are compared and converted into dice. Each die has six sides with half containing symbols that denote success and half blank faces denoting failure. Sometimes the challenges are opposed as in a combat challenge where the attacker roles his dice pool and counts up the successes and matches the result against the defender, who also rolls his dice pool and counts up successes. If the attacker’s total is higher than the defender’s total then the difference is applied as damage. Some units might have special abilities that modify the damage either positively or negatively so the final amount subtracted from the defender’s hit points can vary. Below is an example of a ground to ground combat challenge where an Imperial Marines Unit from the Empire of Man has initiated an attack against an independent pack of Howlers. The Marines have an attack of 7 and the Howlers have a defense of 1. The Howlers get a bonus of 1 die from the terrain since they are defending . You can see the two sides dice pools lined up here in the challenge resolution display. Notice that the Marines have rolled 5 success and the Howlers came up empty. So 5 damage points would be applied to the Howlers, who only having 2 hit points total are destroyed and removed from the battle. Challenges can also be unopposed. In this case the defender’s dice pool represents a target threshold level that must be met by rolling the challenger’s dice pool. When your heroes create technology or tactics cards this is what occurs. 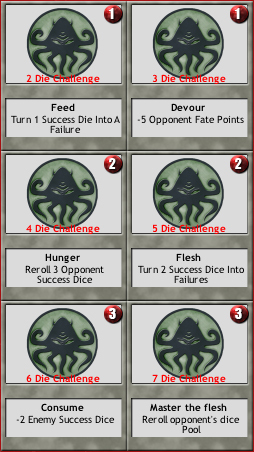 Depending on the level of the card you want to create you will have to roll a certain number of successes. You can use tactics cards in these situations as well. As is the case with most 4X type strategy games (eXplore, eXpand, eXploit & eXterminate for you behind the power curve newbies) the early game in Armageddon Empires is a lot of fun. There is a certain joy in exploring a new landscape every game. 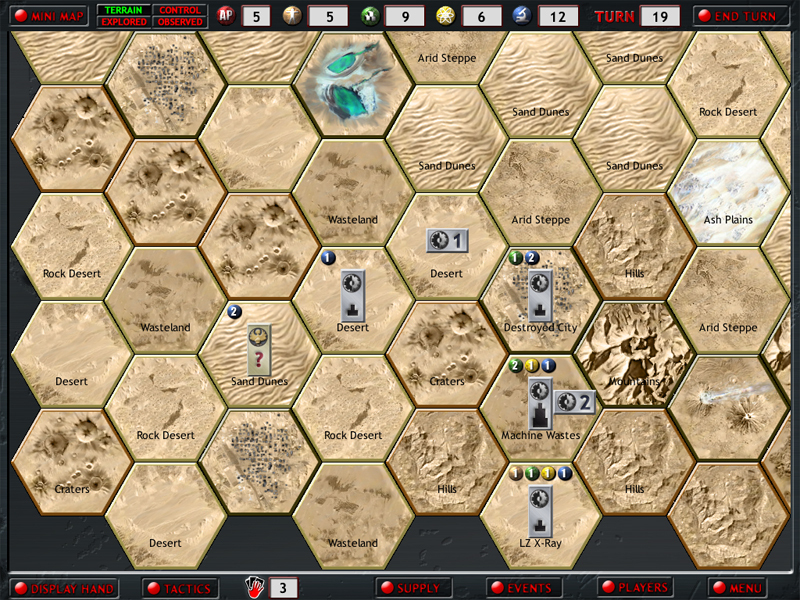 Since each terrain tile is fully modular and every map is randomly generated each turn, you can get some interesting topographical challenges. The first thing you notice is how open the map is. Are you facing lots of sandy desert, dunes and wasteland or is there a mountain chain or line of crags and badlands dominating the map somewhere? From a programming stand point getting an interesting map generated every game was a small challenge. As the famous Dr. Forrester once said, “It’s really quite complicated actually, but all you need to know is…” that I generate a height field based on a random seed or two of the highest level and follow it with some Markoff chain processing….then perform some errosion and wallah, you get some interesting maps that make topographic sense…each as unique as a snowflake. The first thing you want to do is get some unit/hero cards deployed to your initial stronghold and start exploring the board. It can be both dangerous and rewarding. The best units to start exploring with are dedicated recce units or special agent type heroes that have the “Stealth” special ability. Stealh on any unit or hero will cut the strength of enemy observations in half. Basically dice are rolled behind the scenes to determine whether a unit is spotted. Getting a stealthy unit out first or one with the ability to see into neighboring hexes with the “Recce” special ability will decrease the chance of losing the unit when it stumbles upon a group of Tentacle Beasts or Rad Zombies. As your units explore the wasteland they will come across “Specials” that will give them extra resources, attachment type cards or even allies that join your cause. “Specials” range from lost nomad caravans to hidden secret vaults filled with exotic technology. Some of the stuff you stumble across can have a big impact on play so it’s best to get out there and find it. An enemy that comes across a rare city killler nuke is going to ruin your day if he finds your HQ and has the means to deliver it on target. Here is a screenshot from a game that I am testing out right now. I’m playing as the Machines and have explored the local area. Along with some resources to jump start my deployments, I found a cache of flechette guns that I attached to a unit of Advanced Cyborgs. It took me a while to build some resource collectors in the tile that I place below my stronghold but eventually I got it done. After that I built an army and drove out a group of canibals from the ruins of the great city just north of my stronghlold. It contained “materials” and “tech” resources which is just what my faction needed and I hurried to get some collectors up and running there. Just as I finished construction, those pesky humans showed up and built a tech collector. You can’t see the Imperial Army that showed up from the north because I crushed it. However, I’m going to have to get a move on it and find the Imperial HQ. I have already lost two units of spider bots and a lich platoon trying to probe forward and find it. Human airpower is a killer if they catch your units out of supply which really lowers your defence. You are currently browsing the Forgotten Lore blog archives for March, 2007.